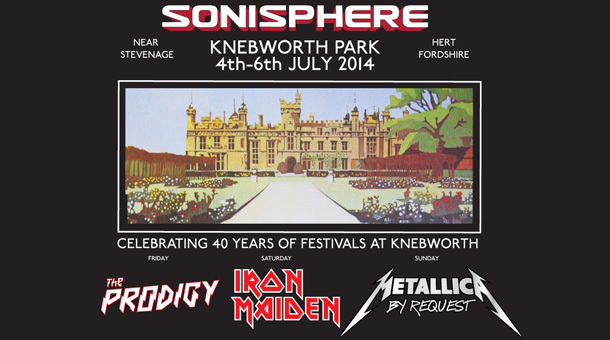 Airbourne, Alice In Chains, Slayer, Mastodon, Ghost, Gojira and Karnivool have been added the the bill for this year’s Sonisphere festival at Knebworth Park on July 4-6. They’ll join headliners Iron Maiden, Metallica and the Prodigy for the event that marks 40 years since the first event at Knebworth. Among the seven new additions only Ghost haven’t previously taken the Sonisphere stage. Alice In Chains, Mastodon and Karnivool have also confirmed they won’t appear at any other UK festivals in 2014. “tweak” their set as they end their Maiden England retrospective world tour, with some song to be played live for the last time ever. Meanwhile, Metallica’s set will be chosen by ticket-buying fans as part of their By Request European festival tour. Many more bands are to be confirmed in due course. Earlybird Sonisphere tickets are on sale now via http://sonisphere.co.uk/ priced £170 but with limited availability. The event’s deposit scheme is now running, meaning fans can reserve tickets for an initial payment of £50.